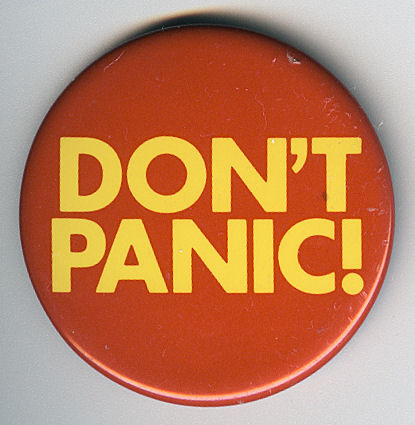 The Hitchhiker's Guide To Dealing With Financial CatastropheEliminate The Muda! Don’t Panic! Words to live by. Virtually any financial challenge that you find yourself in can be dealt with. The key is to not panic. When we panic, it simply makes the problems appear worse and may lead to a belief that our problems cannot be solved. When we have lost hope we also loose our motivation. When faced with a financial challenge our first step is take responsibility. For most of us, we can only blame ourselves. It was our own bad decisions, lack of decision or poor spending habits that fueled our problem. Some of us arrive in hell through no fault of our own; a major medical issue, a job loss or other mishap. But then how many of us are prepared for the unexpected? This post was listed in the Carnival of Debt Reduction. Please take a look for other great articles! Whether we got ourselves into the mess or not, now is time to get out of it. Putting it off only allows your issue to grow worse. By all means, please fix it yourself. Delegation of distasteful tasks only increases the potential for communication errors and delays. Commit to finding a solution. For virtually any challenge there are options to be explored. It may not be easy or painless but a solution likely exists. Resolving your financial catastrophes may mean serious sacrifices on your part. Unexpected financial challenges are something none of us wants, so let’s make it a priority to address it. Before you can address any situation you must first fully understand the situation. If you are in debt up to your eyeballs because of a drunken spending spree then you better quit drinking. For most there will be multiple factors that must all be addressed. All potential causes should be thoroughly examined. Once you fully understand the current situation, you must establish a plan to address it. Recovering from identity theft would be a different animal than an unexpected household expense such as an A/C replacement. In any case, it might be best to establish S.M.A.R.T. goals to hold yourself accountable. Once you have a plan in place and begin implementation, you must follow through. Knowing fully that there will be new obstacles in front of you, setbacks are likely. How you handle each of these events will determine how quickly and how effectively you achieve your final goal. My favorite saying from Einstein – “Insanity is doing the same thing over and over again and expecting different results.” Having suffered the burden of an unexpected challenge you may be able to leverage the experience to prevent a re-occurrence. Taking the time to understand the events leading up to your challenge you may be able to establish safeguards to prevent from having to deal with the problem again. And please, do not forget the most important tool of all. A Towel! Readers: Do you handle the unexpected well? Can you stay rational in stressful situations or are you more willing to pay a premium to get someone else to handle your problems for you? That Einstein quote is great :). I had a very bad financial patch and although i don’t have a lot of cash I get along fine right now…. If I had panicked in the rough time I may have fallen under the ice…. great advice. I love that insanity quote, too. But I *don’t* love how often it comes up in my own life! .-= Monevator´s last blog ..The biggest threat to long-term wealth =-. Ha ha, I have no doubts we could all be sectioned for something! .-= Roshawn @ Watson Inc´s last blog ..Do The Rich Pay Their Fair Share Of Taxes? =-. and while yes there are alot of real problems that noone sees coming until they blindside you and knock you right off your feet, but like you said ‘panic’ is the absolute wrong way to deal with the issue. And if you can live your life in a ‘balanced’ manner and are working diligently with keeping avoidable problems at bay you are will be in a much better frame of mind to deal with those catastrophes that get us all at one time or another. .-= finallygettingtoeven.com´s last blog .. =-. @Forest – Unfortunately I have panicked and it just ended up costing a lot more money and time. @Monevator – No doubt! The more I remember that quote though the more efficient I find myself getting. Maybe someday I will earn a pass out of this asylum! @Rowshawn – I hate saying my dad was right, but he was r*&^t! It all begins with personal responsibility. @finallygettingtoeven – One of the greatest forms of waste is doing things over. Like you say if we could just take a little care to prevent problems life would be so much richer!